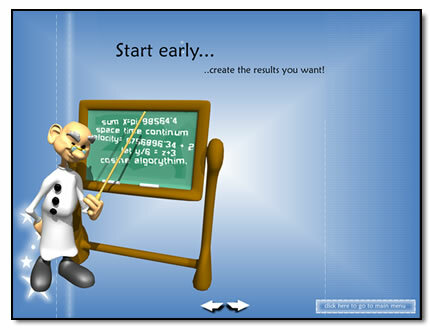 (You may refresh page to begin again) , Non-YouTube Video Here! VIDEO SCRIPT HERE! 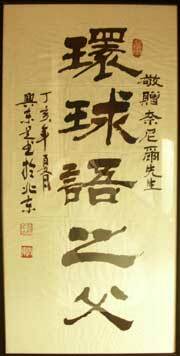 Globish The World Over in Chinese translation. Opportunity for NNS English teachers. 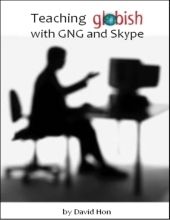 In this free 56-page e-book, you learn how to put all the pieces together: live teaching, small classes, easy scheduling, no travel, consistent 24/7 materials, and pertinent Globish-English using GNG. More than a lingua franca, the rapid adoption of 'decaffeinated English', according to the man who coined the term 'Globish', makes it the world's most widely spoken language. The House of Commons Foreign Affairs Committee has just published a report Global Security: UK-US Relations whose headline conclusion (The "Special Relationship" is Dead) interests me. This, it seems to me, is potentially another milestone in the evolution of the phenomenon I've occasionally referred to on this blog as "Globish". The first translation of Globish The World Over , in Hungarian, was announced today by the International Globish Institute. The side-by-side e-book form will be offered beginning this week by Globish.com, with other potential distributors in discussion. Translation partners are now at work on Japanese, Russian, Dutch, and Hindi versions, with preliminary discussions involving Chinese, German, Spanish, Portuguese, and Arabic versions. The original work, Globish the World Over, observes how a billion people are in need of a consistent language to do business across the globe. It describes how the problem is being solved by many non-native English speakers, and discusses the specific outlines of the Globish approach that is being noted as perhaps the only possibility for true Global talk. 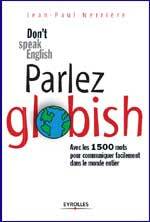 Globish The World Over was just published this summer. Among many good reviews was that of Robert McCrum, literary editor for The London Observer and writer of The Story of English and the upcoming book Globish: The Making of Global English (W.W. Norton, Spring 2010). McCrum: "I must congratulate you on GLOBISH THE WORLD OVER. It's a pioneering text of great importance, full of enthralling insights for native and non-native English users alike." Clearly, this new Hungarian version of Globish The World Over -- and other translations to come -- will be for readers who choose to use their native tongue to learn about this Globish tool for international communication. However, this side-by-side translation form also lets students who are learning English see the basic structures of Globish, line-by-line in Hungarian. 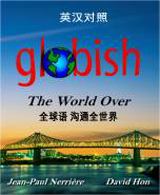 Review of the book "Globish - The World Over"
‘Globish - The World Over’ is a 168-page ebook written by Jean-Paul Nerriere and David Hon. This ebook is divided into two parts - ‘The Problem with Learning English’ and ‘Elements of Globish’. It featuers 23 chapters. IT would be worth spending $9.95to read this book which has come with a new concept and could make a BIG story in terms of communication. That the French resent the global supremacy of the English language is nothing new, but a newly evolved business-speak version is taking over.